For many people, a trip to the dentist can be a stressful and nerve-wracking experience; they’re willing to believe implausible facts about dental health and treatment to justify not visiting the dentist. Also, because of the nerves, patients are more inclined to be wary of any type of dental procedures. Even though there are more than 15 million people in the country that underwent dental crown and bridge replacements for their missing, cracked, or decayed teeth, there are still several misconceptions surrounding the entire treatment process. Don’t let these myths get in the way of obtaining the proper dental care for you. Caps and crowns can restore your oral look and function. Let’s set the record straight, and reveal the truth about dental crowns, so you can understand what they can offer you. Myth 1: Getting a dental crown is extremely painful. Dentists advise patients to get a dental crown to put an end to any oral pain – not induce pain. Even though the teeth don’t need to be prepped before a crown procedure, the treatment is not going to hurt. 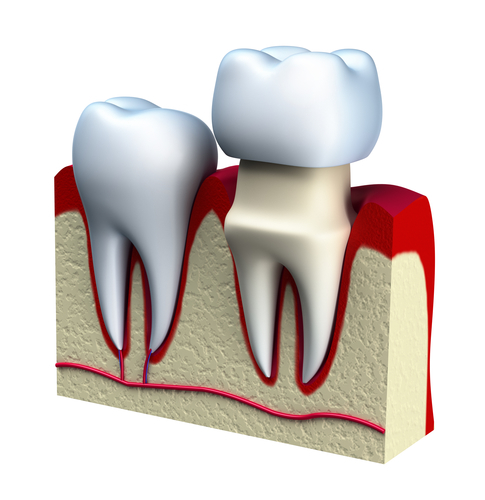 The affected area will be numbed, so there should not be any pain or discomfort during the process. Additionally, there is minimal recovery. The only thing you may experience is the numbness for a few hours until it subsides. You may also have a sensitivity to biting or to cold and hot foods for several days. However, there shouldn’t be any discomfort after a week. Myth #2: It looks unnatural. One of the most common myths about this restorative dental option is that it does not look natural. In reality, unless you reveal to someone that you have a dental crown added in, they will never be able to notice anything. Compared to full-mouth dentures, where some patients say that their results look fake and artificial, caps and crowns look just as normal and natural as real teeth. An experienced dentist can expertly match the cap or crown to the appearance of your teeth so that it will blend in naturally. Myth #3: Crowns don’t chip. Crowns do tend to chip. Even though caps and crowns are made from durable materials, they have the potential to break. Fortunately, replacing and repairing a dental crown is a reasonably straightforward process. With that being said, you still need to practice good oral health and hygiene to take better care of your teeth. Myth #4: Crowns are prone to cavities. This is a common misconception incited by the belief that a crown or cap prevents tooth decay. As the name suggests, a dental crown or cap is put above the tooth enamel that’s already there; thus, even though the surface where the crown is won’t get a cavity, you’re still likely to get one underneath the crown. An effective way to prevent this is by regularly brushing and flossing. You wouldn’t want to get a dental crown only for it to be ruined by cavities – which you could have prevented by practicing good oral hygiene habits. Myth #5: There is only one type of dental crown. Nowadays, crowns are made of several materials. The most popular types are metallic alloy and porcelain. Both of these materials have their advantages and disadvantages. Porcelain provides a nicer look and is used for the front teeth. However, it’s not a very durable material. Metallic alloy, on the other hand, is the material used for the molars and other back teeth, because it is a more robust material. Also, this type of material will let you chew and eat usually without any issue. The downside is it’s rather unsightly and noticeable – whereas porcelain can blend in seamlessly with your other teeth. Myth #6: Food and drinks stain the crown. It is commonly believed that crowns will get stained over time as you eat and drink; this could not be further from the truth. Since they are made of porcelain, crowns cannot be affected by food and beverages. Thus, it’s essential to get the right shade of dental crown for you. A dental crown or cap is a quick and convenient way to regain the look and feel of your damaged or missing teeth. Although there are myths and misconceptions out there about this restorative dental option, you should consult with your dentist. He or she will be able to help you find the best dental solution for you. © 2013-2019 Family Dentistry Brightens Your Life. All Rights Reserved.